Sample Templates have been around for a long time, but companies have started to understand the advantages of the template only a few years back. 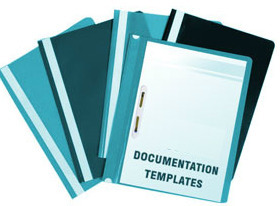 Using readymade templates is really easy and by using them you can save a lot of time that you would have otherwise spent in drafting manuals, procedures, forms, etc. To understand the need for Quality and HSE templates, you should first understand the need for manuals. Manuals are the basic handbook that should be present in every organization preparing for QMS and HSE system certification. In both the cases, you would want your employees to comply with some standards. You would also want them to educate about how the standards are complied with and what steps have to be taken in case non-compliance has been noticed. You obviously cannot educate all the employees about the standards verbally. You would need a written document that your employees can refer to, whenever required. Such a written document is called a manual and is a necessary document in every organization. The manual describes macro level system and commitment of organization to meet related certification standard requirements. It also demonstrates policy of the organization at macro level, for how they intend to comply with certification requirements. The correct sequence of activities. Any special, environmental conditions, e.g. temperature, humidity cleanliness etc. Reference to standards / codes of practice which must be complied with. The manual or the procedure manual once formed, works like a bible for your company and is the ultimate handbook for all the employees whenever they need guidance related to compliance with related system requirements. It describes the micro level system of the company to implement related system. To make sure that the manual fulfils its purpose, it is important that the manual is easy to read and can be updated without any hassles. An employee should not face any difficulty while looking things up in the manual. These features are important to ensure the relevance of the manual and for making sure that the employees are kept updated about the correct method of doing things in the company. How can system certification templates help in drafting manuals? The answer is very simple. A manual should be well organized and the information that an employee is looking for should be easy to find. Global certification templates define a clear method of drafting a manual by dividing the whole manual into sections and sub-sections then are easy to go through. Information in the ISO manual is than entered in a specific format that has been specially designed to ensure better readability. The HSE templates are used to implement the health, safety and environment related system as per QMS 9001:2015, EMS 14001:2015 and OHSAS 18001 system. It is true that things that should be present in a manual depend on your business because the requirements of businesses differ from each other. Sample templates form a common path for all businesses that can be followed while drafting manuals. You can search for some quality sample templates in order to see if you can use them properly. HSE templates are easily available on our website. All such templates are given in MS Word and user can easily edit them according to own need and can implement the system faster. A well-structured manual would ensure compliance with the standards that would in turn ensure customer satisfaction, and hence, better business. In case of special processes, work instructions are a mandatory element and for this, detailed instructions are needed. These work instructions should be written in the local language by using ISO sample templates, so that they are easily understood by the operators. For the laboratory or Q.C. activity or calibration of instruments, the operating procedure is documented describing how particular activity shall be done. Work instructions are required where their absence affects quality. They include details of how the specific activities are to be undertaken to achieve the objectives / standards. Work instructions define the standards of acceptability. The contents of work instructions should be simple and easy to follow.